During September, in celebration of National Clean-Up and Recycle Week, a number of clean up and recycling awareness activities took place. TGRC got involved through pitching in as well as through sponsorship on some of the key tools required for the clean ups. This included refuse bags, T-shirts and heavy duty gloves to lend a hand to the helping hands! Community members pitched in by participating in a 25km clean-up of the Braamfontein Spruit. Residents, businesses, walking and running clubs as well as schools were encouraged to get involved. 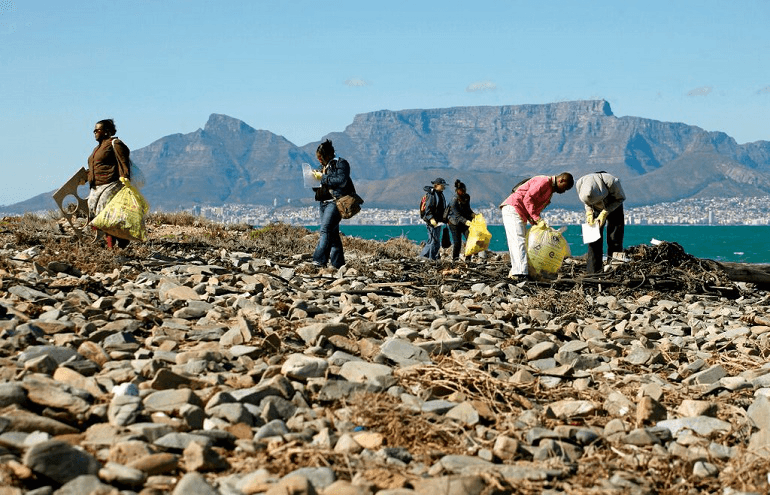 Along South Africa’s magnificent coastline a number of clean ups took place, most notably, International Coastal Clean-Up Day on 18 September. Residents of numerous Kwa-Zulu Natal and Cape suburbs had a fantastic opportunity to get involved and make a difference to their environment. The three Cape provinces alone attracted more than 15 000 people from all ages who flocked to 421 beaches. TGRC together with the National Recycling Forum, Plastic SA, The Sustainability Council, Collect-a-Can, Paper Recycling Association of SA, Tetrapak, Kelpak, Pick n Pay, Tuffy, Garbie, ROSE Foundation and KZN Wildlife ensured that each volunteer received a collection bag, gloves and data sheets to record the most prevalent pollutants that were picked up on the day. Brand SA and Department of Environmental Affairs endorsed the day, with Deputy Minister of Environmental Affairs Barbara Thomson attending a beach clean-up. She encouraged the various packaging industries to continue with their voluntary efforts to increase recycling.